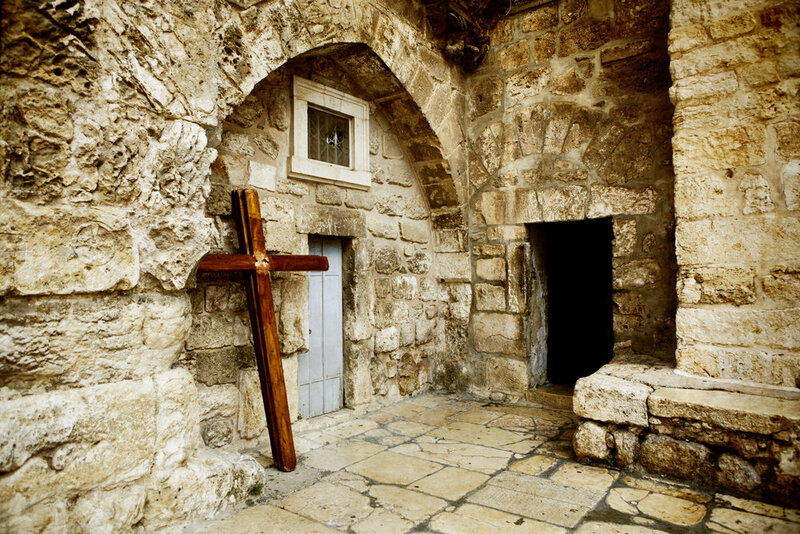 I wonder what the Crusader knights must have thought when in 1099, after a bloody battle to take Jerusalem, the Holy City, they finally saw the tomb of the Lord Jesus. At home, they were used to seeing churches or their crypts with the grand tombs of royalty and higher clergy, elegant sarcophaguses housing their last mortal remains, often topped by a life-sized stone effigy of the deceased. Of course, there was no coffin housing the remains of the Resurrected One nor need for a sculptured effigy. What, then, was there to see? Well, more or less what one sees today, a kind of shelf on which an enshrouded body could be laid or, more precisely, a marble slab over the remains of the rough-cut stone shelf of the original burial place. What would that original place have looked like? It may well have been a kind of natural or artificial cave, somewhat modified, with shelf-like niches for the placement of the bodies, a little like the catacombs in Rome. But, remember, these Crusader knights were seeking and arriving at this holy place over a thousand years after the burial of the body of Jesus—and a lot had happened during these thousand years. Whatever the case, in a relatively few years after the death of the Lord, the tomb area became inside, not outside, the city when the new northern wall of Jerusalem was built. However, following the siege of the city during the first Jewish-Roman War in the year 70, Jerusalem and its temple were razed to the ground. In 130, the Roman Emperor Hadrian vowed to rebuild the city, but he redesigned it along the classic model of a Roman colony town and called it Aelia Capitolina. Part of his plan was to obliterate all traces of sites venerated by the early Christians within his new city by building a pagan temple over them, with a statue of Jupiter over Calvary and an altar to Venus over the tomb of Jesus. What a paradox! His plan to obliterate the holy sites and their veneration actually preserved and marked them. As a result of the visit of the first Christian Empress Helena, mother of Constantine the Great, to the Holy Land in 326-328, the pagan temple was removed, the sites of Calvary and the tomb were revealed, the remains of the true cross were found, and a great Church of the Resurrection was constructed by the emperor and inaugurated in 335. As described by Franciscan Father Eugene Hoade in his classic Guide to the Holy Land, its atrium or entrance courtyard was accessed directly from the Cardo Maximus, the principal avenue of Aelia Capitolina. Directly across the atrium was the basilica-style church with five naves and an apse, dedicated to the mystery of the Resurrection. In a garden behind the basilica were two important sites to be venerated: to the left was a great stone block, the very site of the crucifixion, carved from the hill of Calvary, adorned with precious stones, and surmounted by a cross. Across the garden, opposite the apse end of the basilica was a great rotunda enclosing the tomb of Jesus. Again, the surrounding rock was removed leaving only the portion in which the tomb had been excavated standing and enshrined in the rotunda. Our modern mentality is taken aback by this alteration of historical sites. We expect to see a famous place in its original setting, but this wasn’t the mentality of Constantine’s time; their way to display something precious was to cut, shape, and mount it in a beautiful setting as, for example, we would cut, shape, and mount a diamond to be part of a ring or necklace. However, the beautiful works of Constantine lasted not quite three centuries. What happened was this: the continual political tensions between the Byzantine (Eastern Roman) Empire and the Sasanian Persian Empire had erupted into a full scale war in 602. Under Persian Emperor Khosrow II, his armies invaded and plundered Byzantine territories, and, since by then Christianity was the imperial state religion of the Romans, their churches were public buildings, targeted for destruction. In 614, this fate befell Jerusalem and Constantine’s church. The Persian occupation was short-lived. After the withdrawal of their forces, the Church of the Resurrection was somewhat restored by Modestus, Patriarch of Jerusalem. However, the Byzantines soon again lost their control of the Holy Land, this time forever, when it fell into the hands of conquering Muslim armies. 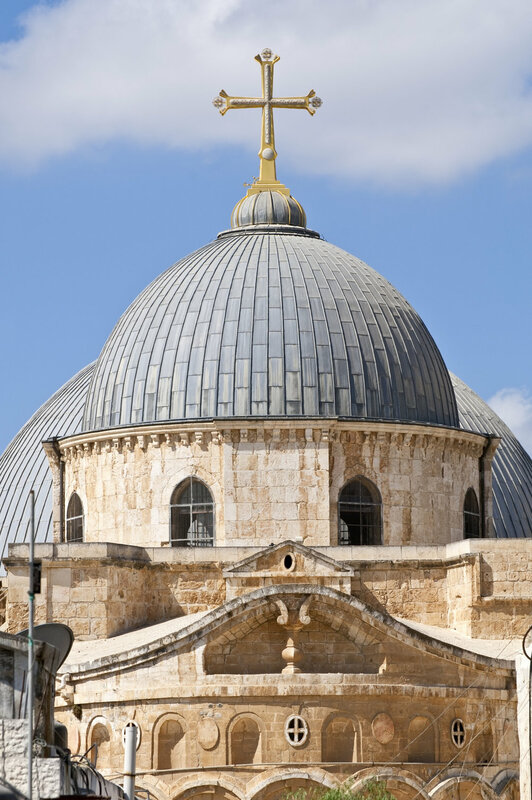 Happily, the Church of the Resurrection was respected by Caliph Umar when he traveled to Jerusalem to receive the submission of the city in 637, for Islam venerates Jesus as the greatest of the prophets and messengers of God, except for the Prophet Muhammad. Unfortunately, centuries later, the Caliph Al-Hakim (996-1021) did not follow in Umar’s footsteps, and in 1009 he had the great church in Jerusalem again destroyed. With the permission of Al-Hakim’s successor in 1042-1048, the Byzantine Emperor ConstantineIX reconstructed some of part of site, not rebuilding the great basilica, but enshrining Calvary, the tomb, and the garden area into a more modest-sized church. Intended or not, this gave greater emphasis to the passion and death of the Lord even though the new church was still known by local Christians as the Church of the Resurrection. This was what the Crusader knights found in 1099. During the following 88 years of Crusader control of Jerusalem (1099-1187), the church, called by these invading Western Christians as the Church of the Holy Sepulchre, was somewhat further modified, especially with the creation of some crypt chapels under part of the area where the great Constantinian basilica-church once stood. As the following centuries passed, there was no further damage done to the shrine by political forces, but by natural forces, yes, especially by fires and earthquakes. Various major and minor repairs and restorations were made, but, even so, today’s visitors are still viewing the structure of Crusader days. Under the rule of pagan Rome, Christian Rome, Muslim caliphates (except for the Crusader period), and, during the last century, Great Britain, Jordan, Palestine, and now Israel, the church in Jerusalem that is the focus of pilgrimage today is an enshrined place of the crucifixion, burial, and memory of the resurrection of Jesus, an architectural patchwork in the heart of the Old City. One legacy of Crusader days is the regrettable misnomer, calling the Church of the Resurrection the Church of the Holy Sepulchre. One doesn’t go there so much to view and pray at an empty sepulchre as to mediate on and celebrate with the eyes of faith Jesus’ triumph over sin and death opening the way that leads to the fullness of life.